It’s a lot to ask a machine to be both a laptop and a tablet, but Acer comes damn close to nailing it with its new Switch Alpha 12. 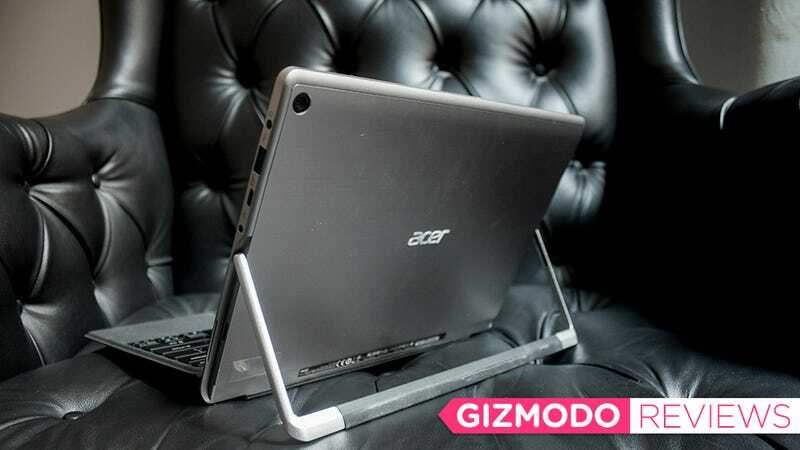 To make it work, Acer had to get weird with design. Acer’s not the first to try something unusual to make a hybrid that combines the utility of a laptop with the efficiency of a tablet. Microsoft, for example, embedded a discrete GPU in a keyboard that then docks with a tablet when making its Surface Book. But for the Switch Alpha 12, Acer really thinks outside the box by installing a built-in liquid cooling system. Acer’s Switch Alpha 12 is another example of the growing number of computers trying to be the next evolution of the laptop PC. Almost every company now has a horse in that race, whether it’s Apple’s iPad Pro, Huawei’s Matebook, or Samsung’s TabPro S.
And like the others, the Switch Alpha 12 is a laptop-tablet hybrid. You can tell right away that it focuses most of its energy on being a laptop because of its most distinct feature, that internal liquid cooling system. This allows the Alpha 12 to use a much more powerful processor than most other hybrids while also being much quieter. It’s a hybrid that actually transforms into a laptop without sucking. Of course, Microsoft has been building something similar for years now with the Surface Pro, but Acer achieves almost the same performance for way less money. For a similar Surface configuration to the Acer I reviewed (i5 processor, 8GB RAM, 256GB SSD), Microsoft charges almost $500 more, and that’s not even including the keyboard, which Acer throws in for free. For the last week, I’ve replaced my normal work laptop—a Macbook Air— with Acer’s Switch, and it completely holds up. With 8GB of RAM and a sixth-generation Core i5 processor, the Switch never hangs up and makes working with lots of tabs (a necessity for my job) no problem at all. Granted, video editing would still be a chore with just 8GB of RAM, but then again you really shouldn’t be considering a hybrid in the first place. Acer also fits in a 12-inch IPS LCD panel with 2160x1440 resolution and it doesn’t shun ports like most hybrids. It keeps one USB 3.0 port for all your “older” peripherals, and a Type-C port for next-gen stuff. You can also charge the Switch via USB-C, though it comes with its own proprietary charger (and additional power port). If you want to get some work done, which for me means powering an external high-res display, you’ll need a Type-C dock. In many ways, the Switch Alpha 12 is the first hybrid I didn’t become almost immediately frustrated with. That’s because the Core i5 processor could actually handle the workload. In fact it was so good, I could forgive some of Acer’s quirkier design choices. The device’s uneven bezels in particular set off the OCD alarms in my brain. Because Acer packed in all the ports on the right side of the device, it likely needed the extra internal space. In landscape orientation, the left bezel is about 16mm and the right is 20mm. Remember Acer: There is beauty in symmetry. Although not horrifically different, you can hear a plastic-y rattle when tapping on the Acer keyboard that just isn’t there on the Surface Pro 4 or HP’s Spectre X2. You can easily solve this by just laying the keyboard flat of course, but it’s not nearly as comfortable. This might sound nit-picky, but it shows the “death by a thousand cuts” that affects the Switch’s entire design. For another example: Acer uses an arm kickstand that’s great for setting up in several positions on a desk, unlike Huawei’s Matebook or Samsungs TabPro S, but a nightmare for lapability. Yes, it’s even worse than the Surface. Also, this thing is just heavy. Approaching 2lbs (without the keyboard), the Alpha is almost a half-pound heavier than the iPad Pro in tablet mode. This is where you can see Acer sacrificing maybe a little bit too much while trying to make a work machine that’s also mobile. One of the big draws of hybrids are that they’re supposed to be less cumbersome than lugging around a full laptop. For the Acer Switch Alpha 12, that’s not really the case, considering some laptops, like the ridiculously light Samsung Notebook 9, are actually lighter—keyboard and all. Acer’s Sylus is an extra $50 but might be useful with future Microsoft software updates. But it’s really battery life where the Switch Alpha falls woefully short. When I’d take the Alpha off the charger and keep working like normal (running Slack, Spotify, and Chrome with a dozen or so tabs), I’d be lucky if I made it an average of four to five hours. It’s best to look at the Alpha 12 as powerful laptop that can make brief mobile excursions for that meeting uptown, to work at a coffee shop for a couple hours, or to watch a full movie on the couch. More often than not though, you’ll be sticking that black brick charger in your bag wherever you go. Battery life is the Alpha’s biggest flaw. Problems aside, the performance you get with the Acer Switch Alpha 12 at just $800 is surprisingly impressive. But like most hybrids, it’s not for everyone. For the passionate laptop fan the thinner Samsung 9 is better—if devoid of touchscreen input. But if want a tablet that actually functions as a fantastic laptop—if you can look past its less-than-stellar battery life—the Alpha 12 is the budget-class juggernaut you’re looking for. Metal brushed design looks nice, though some areas—like uneven bezels—are unappealing. Keyboard could be better, but it comes included so I won’t complain too much. Performance is great. A rare 2-in-1 that has no problems getting some real work done. Cheap for what you get and is nearly $500 cheaper than its Surface Pro 4 equivalent. Battery life is disappointingly on the low end with most hybrids. Your charger will likely become your best friend. Even though it has a neat-o liquid cooling system, this thing can still get pretty toasty.